Janine Schiavi is a Director at Broadacre Financial, overseeing the underwriting and closing of loans. She is a former lender who started her banking career in Merrill Lynch’s Commercial Mortgage Conduit where she worked on loans in retail, hospitality, office, multifamily and industrial/warehouse sectors across the U.S. After Merrill Lynch she became an underwriter and closer for large loans at Nomura Asset Capital Corporation, financing first mortgages, preferred equity, earn-outs, reverse earn-outs, and floating rate securitized loans. 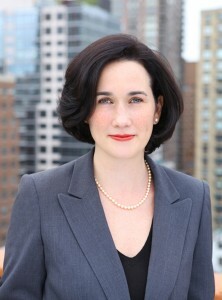 After Nomura, she joined J.P. Morgan Investment Management’s real estate debt team, where she originated, bought, sold, and advised on real estate debt investments for pension funds, non-profits and other institutional investors. Prior to working as a lender, Janine worked for a developer on the renovation and repositioning of 40 Wall Street. Janine is also a professionally-trained French cook, who completed her culinary school internship at Restaurant Daniel in NYC. She has also studied and published psychological research on the treatment efficacy of Transference Focused Psychotherapy for Borderline Personality Disorder. She has her B.A. from Harvard University.